Berlin is a great place to shop with a variety of retail options including boutique fashion, independent designers, luxury department stores, shopping centres, outlet stores, antiques, vintage, flea markets, electronics, souvenirs, books, and more. Not for the faint-hearted, a Berlin shopping runs the gauntlet of shopping experiences, as there is so much variety. However, with so much choice it is hard to know where to start, which is why My Guide Berlin has made it easier for you by allowing you to focus your search by region, budget, or what you are looking for. 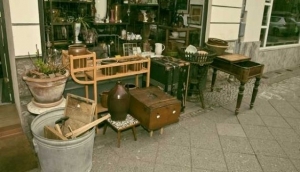 There is not much point trolling through hundreds of listings if you know you are looking for antiques in Charlottenburg now is there? From the late 1970s until his death in 1992, Wojnarowicz produced a body of work that was as conceptually rigorous as it was stylistically diverse. Sing along in a choir of the audience! Every year on May Day the street festival Myfest takes place in Berlin-Kreuzberg. Old Fleas Market is a classic Belin vintage fair in a historic Ballhaus.